O.k., fixed. Should work now. Hello Silvia and everybody !! What a fun class to do and we learned a lot. Most of all, Revi and I had lots of fun and due to this class, we worked a lot on our relationship. Thanks so much !! Always a pleasure to watch you two! The sit up and the hug are too cute! And Revi choosed a realy nice place for his ‘stay with distraction’! Just great! Really amazing how many tricks you two mastered! And what a balance and coordination! 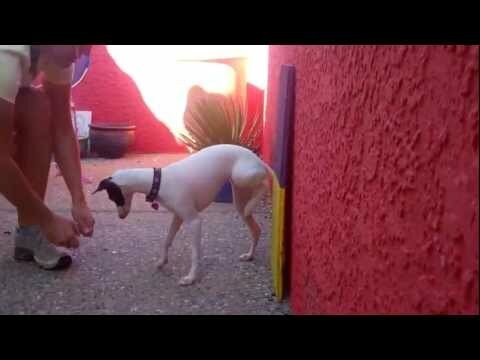 Loved the ball+a paw in a bowl trick, too funny! And the stay on a sofa was hilarious too! Is she black or brown now? Since I know you have all the videos already… Do you want another copy or wait until the next one in out (hopefully before December)? As a puppy she really was brown (as you can see on the picture at the end) but now she is black with a brown shine, she is definately not black-black. We love it ! I would prefer to wait until the next DVD…is it ok ? Thanks so much for this class, we enjoyed very much !! Sure, no problem, just send me an e-mail when it’s out! I tried already many times to enter the foundation october class, but can not enter it. I don’t know what’s wrong….can you help me ? That was great! I’m sure Revi is the most beautifull sheltie I have ever seen! Revi is wonderful. She’s got so much focus and joy. I love her ball in bowl trick. It looks like she’s placing it on her paw. Great handstand. Nice back figure 8! Great rolling the ball and side legs -- she’s so coordinated. But I think my favorite is her reaching-to-the-sky sit up -- very cute!! Hello Cindy Couldn’t believe, that with MovieMakere you couldn’t use jpgs. I have the windows movie maker 2.1028.0 and it has no problems with using jpgs. Maybe you have an older Version or your jpegs are too big. Huh, no idea… Hope you find a way to make it work! Computer problems are so frustrating! Very cool, very creative! And so cool to see Cosi so happy, she sure seems to love her tricks, what a happy little dog! Her paw crosses still make me laugh every time, she is too cute! Looking forward to see the second part of the video too, no problem if with some delay. Also, let me know which video you want for graduation gift! Thank you Silvia for your understanding 🙂 Cosi is much loved by us! And she has a lot of enthusiasm for everything she does, even when I give her a bath, she runs for the tub lol 🙂 When I finally am able to send the second half of this, I will let you know which video, if that is OK 🙂 Cosi and I are really looking forward to beginning Foundations as auditor tomorrow! O.k.! I’m sure Cosi will love agility too! That girl has the best back up! Love your idea of the alphabet -- very creative. Such a lady with her Cross Paws. Her hug is too cute. What nice happy healing with great side stepping! You can really feel the love to your dog in this video! The paw crossing is really enthusiastic! First of all, this class did not just teach me how to train a few tricks. It taught me how to relate to my oh so strange little puppy. It taught me to perceive her quirks as opportunities to train and develop some special talents. It taught me to speak her language, and it taught me how to play, play, play. Nonetheless, I’m still really proud of this little girl. I got her at 10 weeks and it was all I could do to get her to pay attention to me. So it’s my hope this video demonstrates my pride in our little journey. I kept a couple bloopers, used clips of our play time, and even allowed big brother Voltaire to get in the act. You’ll laugh when you see these and remember my struggles getting her to simply back up. Very cool! Loved the title, A PhD in Fun! 🙂 You sure mastered many tricks and Gemini sure gets extra points for cuteness! And what a speed, I’m sure she will be a really great agility dog! Beginnings can be hard sometimes -- but it’s through challenges that we learn! 🙂 Let me know which video you want! Of course I love Gemini (hey, she’s a sighty -- what’s not to love??). She definitely gets extra cuteness points. It’s so hard to get that focus on US in our sight hounds -- you have done such a great job with her. I love her 2o2o. GREAT hand stands especially the handstand on the cone (LOL). So clever of a girl. She’s so athletic and so joyful — “Look MAMA, I got the BUNNY!” -- I can’t WAIT to see this girlie in agility. Look out world! Thanks Rachel. She made me laugh with that cone handstand. It was the first time I’d used the cone for beginning cik/cap and that was one of her voluntary behaviors! This from the girl I couldn’t get to back up. She’s a psycho about the bunny--I told the guys to really give it some speed as she come at it hot. Well, after that incident we pulled her back off the line and gave the lure a head start! See you in agility foundations! Unfortunately I an not see your video in Germany. It is closed because of the Music. It is a pity! Could it still be seen in the other countrys? Cool! She sure knows enough tricks for the whole book! Great job with the video too! Let me know which video to send you! Thanks! And o.k., just mail me when it’s out! Finally! Our puppy class review. I didn’t include all of the tricks, there are so many! Here is about twenty of them. Thanks for such a fun class and thanks to everyone for sharing their great videos! I’ll see most (all?) of you in foundations! Great job!!! His balance is amazing! And what a well mastered tricks! The coins are sure impressive! Let me know which video you want to get! I think the cik/cap video might be most helpful for foundations class! I loved your video! Toby is so beautiful and graceful, so enjoyable to watch! You two look like a wonderful team, you really knows the tricks well… It was fun to watch Toby tap the door twice when it didn’t close that one time, lol… Cosi does that too 🙂 Our dogs are so funny! I always enjoy watching Toby, I can’t wait to see him in Foundations. Great job! Mia is so cute with all her tricks, loved the ball rolling! Let me know which video you want to get! She looks so comfortable with her skateboarding and ball balancing. here is our small video after big training break but now we may to learn all tricks during the autumn/winter:-).We hope to meet with classmates in agility classes. Thank You, Silvia and thanks to all. Great!!! Not many tricks left to master at all! Loved the slamming, that was some real slamming! 🙂 Very cool paw crosses and impressive 4in too! Let me know which video you want for a graduation gift!